For a quick, relatively budget-savvy (but delicious) dinner last Friday, I suggested to Marcus that we go to Totto Ramen in Hell's Kitchen. When we arrived, there was a small crowd in the makeshift foyer and outside, but I figured they turned over parties quickly in and out of the small noodle shop. We put our names on the clipboard hanging on the door and patiently waited for a table. I heard about Totto Ramen from a few friends of mine, raving that it is arguably better than Ippudo's original akamaru modern. I knew had to taste it myself in order to make a fair assessment. After waiting about 20-30 minutes, they sat us at the counter, where we could watch the noodle chefs and all the cooking action! 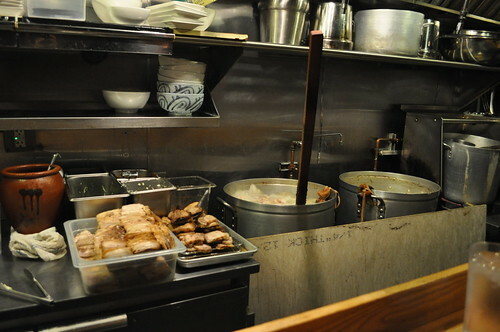 The tubs of secret ingredient ramen noodle soup broth alongside chunks of char siu, special house-broiled pork. 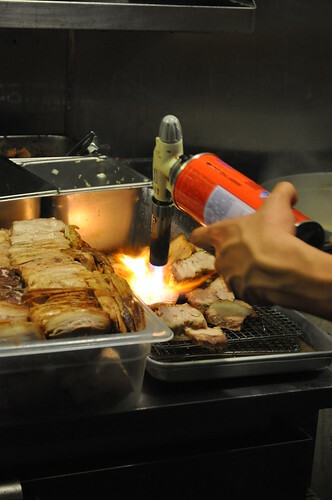 The chefs use a blowtorch to char and broil the pork chunks. Look at that flame! Crazy! 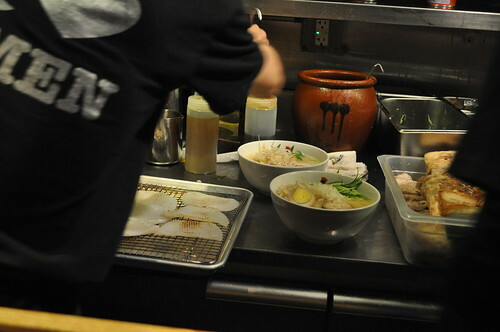 The chefs prepping our bowl of ramen noodles! I ordered the classic Totto miso ramen with the finest koji miso, a scoop of ground pork, a seasoned hard-boiled egg, scallion, bean sprouts, onion, and char siu pork in original Paitan soup. I ordered extra char siu because I like a good meat-to-noodle ratio! 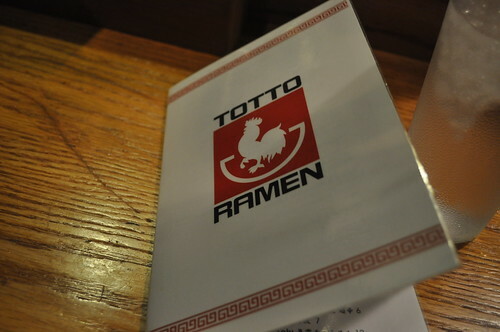 Unlike the straighter kind of noodles found at Ippudo, Totto Ramen uses the wavy noodles typically found in the ramen noodle packages at the grocery store. I really liked the texture of the noodles--it had a nice Japanese equivalent of al dente kind of crunch. The char siu had this nice smokey flavor, and the slightly charred edges gave it some delicious character. Plus, it'd be hard to ever say that fatty pork chunks are flavorless and unappetizing. I think my favorite part was the char siu or the noodles! Being the Scoville junkie that he is (well, maybe not to that extreme), Marcus went with the Totto extreme spicy ramen (the lack of grammar is seen in context, so please excuse it here). 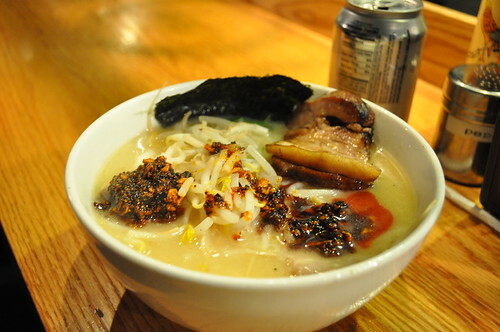 It just like the Totto spicy ramen on the menu, with the original rayu (a chili-infused vegetable-sesame oil) with the same Paitan soup base as my ramen dish, topped with scallion, char siu pork and nori, but with "extra spicy" rayu (called extreme rayu on the menu). In fact, there are little dingbats of chili peppers seen on the menu to help indicate how spicy a said sauce or ramen dish actually is, i.e., the more chili peppers you see next to a menu item, the spicier it is compared to everything else. Totto spicy ramen received a measly two chili peppers, while Toto extreme spicy ramen received eight and a half chili peppers. So you can imagine how hot that was! 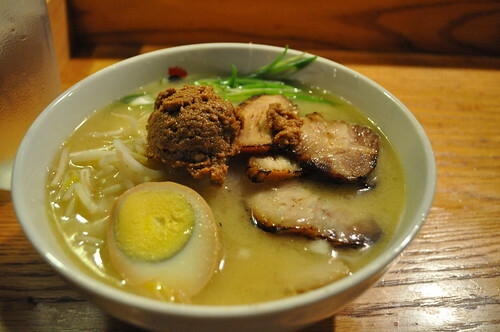 Marcus's bowl of ramen, after mixing the extreme rayu with the Paitan soup. He told me he enjoyed it, but he'd prefer next time to tone it down a notch to something not as spicy so to enjoy the other ingredients besides the rayu. I tried a dab of the rayu, and I like the zing of flavor (it is as if it jolts you out of an oncoming food coma) mixed in with the miso of the soup. I would definitely order a side of the rayu (not the extreme, though) during my next visit so I can dab a little in without going overboard and scorching my tastebuds. Findings: While the Paitan soup base had a lot of depth and a nice balance of miso at Totto Ramen, I still prefer Ippudo's mysterious akamaru modern original bowl of ramen. I think what makes Totto Ramen a little more appealing is its relatively lower cost (about $6 less), and it seems that they give you a little more meat and ramen. 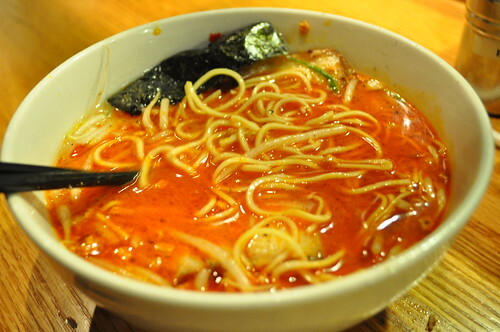 Also, Totto Ramen's offering of the wavy ramen noodles are another plus for me. I like that change in noodle texture once in a while. 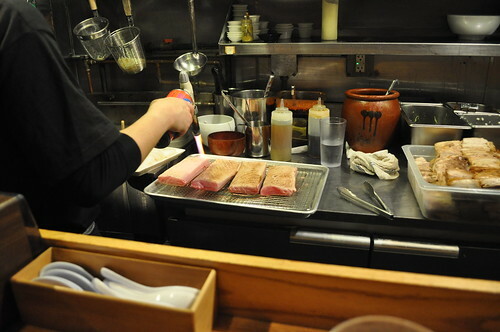 Additionally, I very much enjoyed watching the chefs work their magic on broiling the char siu pork chunks--very cool stuff! 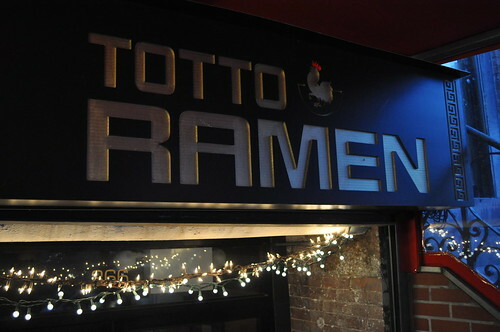 So if you're looking for an affordable bowl of solid ramen noodles, Totto Ramen is a good bet! I recommend getting there as early as possible for dinner during weeknights and weekends. It's a pretty hopping place, and even with the quick turnover, chances are you'll be waiting for a while if you don't get there early enough. Price point: $10.25 for each bowl of ramen noodles (miso or extreme spicy), extra 2 pieces of char siu pork for an additional $2.